The video tutorials for Google’s Nexus One phone are streaming fast and furious onto the web. One of the most impressive ones I’ve seen so far is the Google Maps application for the Nexus One. 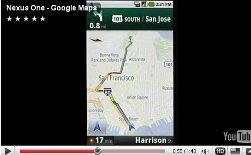 With rich features such as turn by turn GPS navigation, Google Stree View, layers to show you points of interest along the way, and alternate route suggestions when traffic is heavy, the Google Maps for the Nexus One phone is unprecedented.